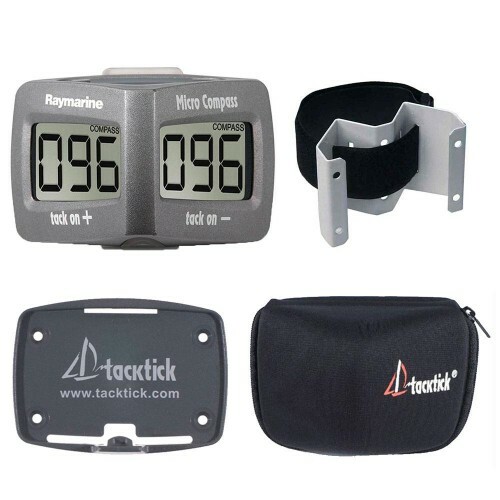 Tacktick micro compass, The ultimate in compasses for dinghies, This micro compass can pick up on every wind shift be it a large or small, Giving you every thing you need from a compass on a tactical scale, it also has a built in race timer. With an easy to read display and ultra fine reading it gives you an advantage over competitors using a normal compass. The Micro Compass tactical scale gives you clear stable figures corresponding on port and starboard tack. The readings whilst tacking are always the same, meaning you never have to remember numbers. Key Features _ No wires or connections to make _ Simple to set-up and use _ Totally waterproof (submersible to 10m) _ Shock resistant _ Lightweight only 153g (0.34lbs) _ Ultra wide viewing angles _ Battery level indicator _ Easy to read large digits Supplied as standard with Soft Carry Case and Clip In Cradle.